This article needs attention from an expert in automobiles or engineering. Please add a reason or a talk parameter to this template to explain the issue with the article. WikiProject Automobiles or WikiProject Engineering may be able to help recruit an expert. An interference engine is a type of 4-stroke internal combustion piston engine in which one or more valves in the fully open position extends into any area through which the piston may travel. By contrast, in a non-interference engine, the piston does not travel into any area into which the valves open. Interference engines rely on timing gears, chains, or belts to prevent the piston from striking the valves by ensuring that the valves are closed when the piston is near top dead center. Interference engines are prevalent among modern production automobiles and many other four-stroke engine applications; the main advantage is that it allows engine designers to maximize the engine's compression ratio. However, such engines risk major internal damage if a piston strikes a valve due to failure or poor maintenance of the timing components or camshaft. 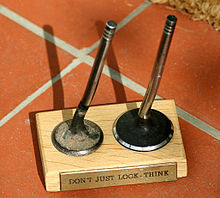 A pair of poppet valves bent by collision with a piston after timing belt failure. The engine was running at 4500 RPM. In interference engine designs, regular belt or chain service is essential, as incorrect timing may result in the pistons and valves colliding and causing extensive internal engine damage. The piston will likely bend the valves, or, if a piece of valve or piston is broken off within the cylinder, the broken piece may cause severe damage within the cylinder, possibly affecting the connecting rods. List of vehicles with interference engines that use a timing belt. This page was last edited on 7 February 2019, at 22:59 (UTC).